2.5" x 8.5" 3" x 4" 3" x 5" 3" x 8" 3" x 11.5" 3" x 15" 4" x 5.5"
Protective non-glare overlay keeps graphic from being tampered with. Double-sided foam tape enables users to mount frame in either vertical or horizonal orientation. 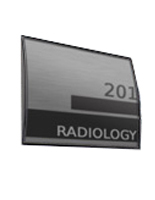 Durable metal construction with silver finish to last for many years to come. 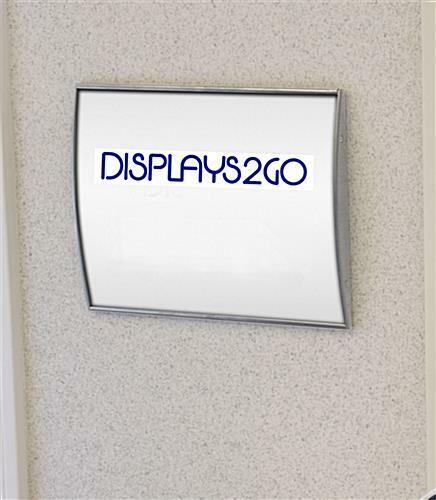 These door signs for office buildings, also known as signage systems, are perfect for use in high-traffic areas like lobbies, hospitals, universities, hotels and office settings to direct visitors or guests to the right area. 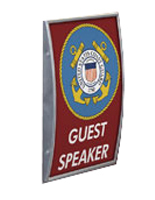 The curved design of these safety signholders is sure to make the displayed graphics stand out and attract attention. 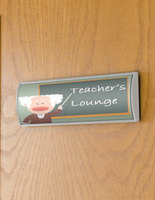 These door signs that adhere to a wall are also ideal for use in hallways or entryways as well! 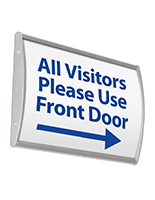 Constructed from anodized aluminum with plastic end caps, these safety signage frames can endure for years to come. 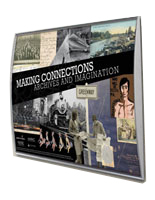 Graphic changes are easy with these directory displays, as no tools are required to change your custom graphics. 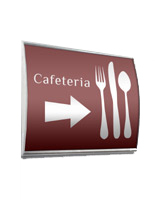 These aluminum door signs include with a non-glare lens to protect your displayed posters. 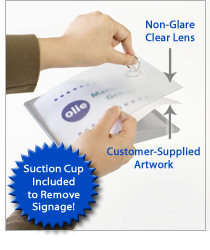 Customers can use the provided suction cup to lift the lens, and place custom artwork underneath to prevent tampering. These name plates, silver door signs feature a silver black coloring, enabling the products to easily complement any indoor environment. These safety poster holders can be used to display room numbers, a company logo, an occupant's name or other custom graphics. 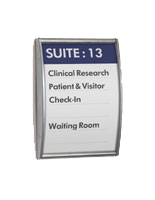 Customers can also purchase multiple door signs to create wayfinding systems as well. 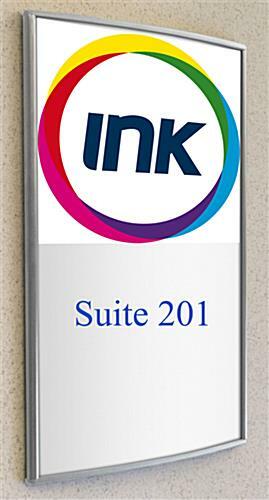 This product is sold without graphics, though users can easily create then print their own custom artwork on any regular printer. These door signs that stick to a wall are equipped with two strips of double-sided foam tape on the back for easy wall-mounting. As a result, these permanent office signholders are an alternative to cheaper magnetic frames which can be removed by the public. 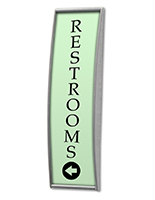 For your convenience, the signholders can be mounted in either vertical or horizontal orientation on most flat surfaces. 8.6" x 16.0" x 0.875"
Product arrived as described and on time. John, we're so happy to hear this! Thank you for your great review. Please let us know if there's anything you feel we could improve — we always appreciate our customers' feedback. Great product! Easy to put up and a great way to change out signs but still make them look nice! Really like them, easy to change notices and look nice in the elevators. Thanks for the great review, Jill! Body material is good. New suction cup looks better but not soft enough to stick the cover out sometimes. Top and bottom cap easily break by a finger as it usually install on public area, it can be re-designed to seat into the frame. We're sorry to hear you're not totally satisfied with your purchase, Ricky. One of our customer care specialists will reach out to assist. Thank you! Looks good but that's it. The signs came in very quick and look great but they won't stick to the walls. I tried 3M Velcro strips and they wouldn't stick. Tried magnets and that didn't work either. I tried sticking these to concrete walls, drywall and metal. They won't stay on any of these surfaces. No picture to show as they are just sitting on a shelf until I can find what will work to keep these hanging up.